Most of the parking surrounding our office is unlimited day parking. There is a section of Cortes Street just after the Robinson Street "garage" entrance that is hourly parking unless you have a permit. Signs are posted on this section. Beyond that one section, most parking along Cortes, Webster, Pearl and Camino El Estero is free and has no time limit. 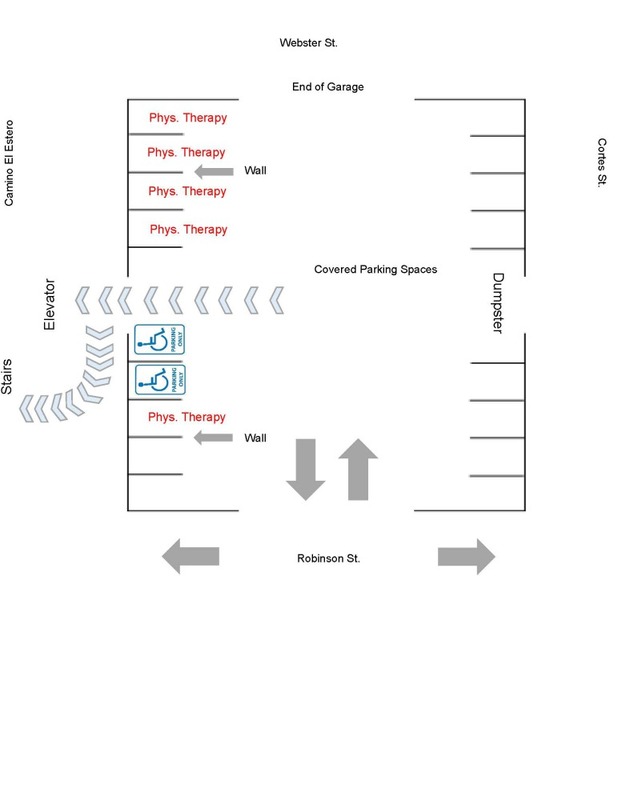 We have a parking "garage" under our office, a diagram has been provided to show where our 5 spots are. There are two ways to enter the "garage" from Cortes St or Camino El Estero. Both have driveways that turn onto Robinson St. that allow you to access our parking spots. It is a tighter street, so be cautious of any cars coming in or out of the garage. There are two "sections" to our parking, one uncovered section with the stairs and a covered section with the elevator. Our parking spaces are in the covered parking section, however, the last two spots closest to the end of the garage are uncovered and you can park there.